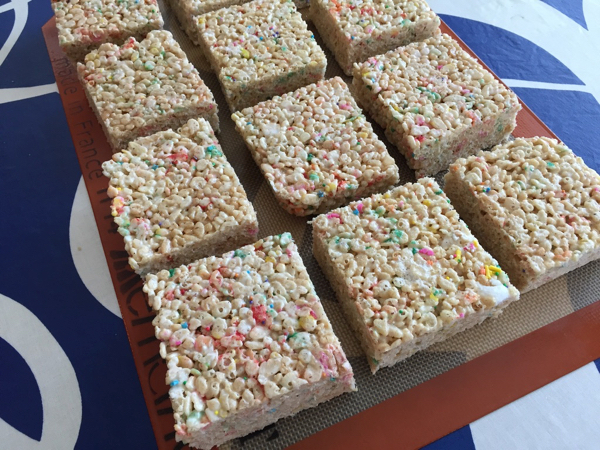 I love rice krispies. Even though they are ridiculously sweet. I don't know of any kid that doesn't like them. 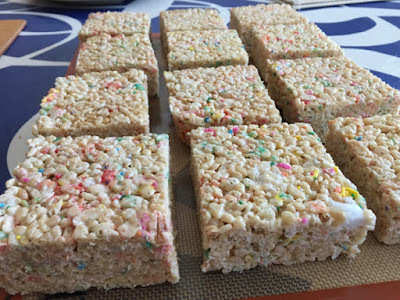 I especially love them because they are the easiest and fastest treats to make. I'm tired these days. From mommying around and from working for the school PTSA. 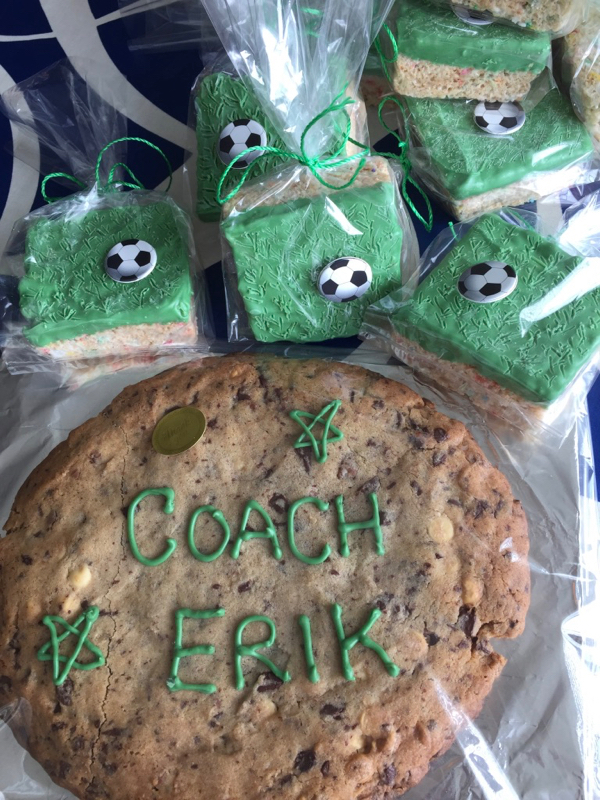 For my son's last soccer game of the Spring season, I needed something to make that was easy, good and of course cute and creative. I came across an image I found online of a treat with a soccer sticker on the bag that looked like it was part of the treat. 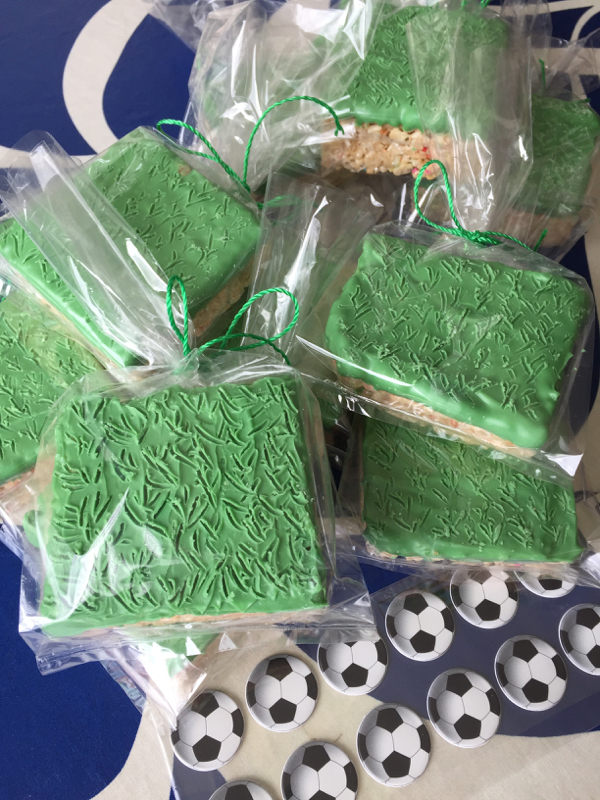 The treat inside had green sprinkles on top of white icing that made it look a bit like grass. I love the idea! 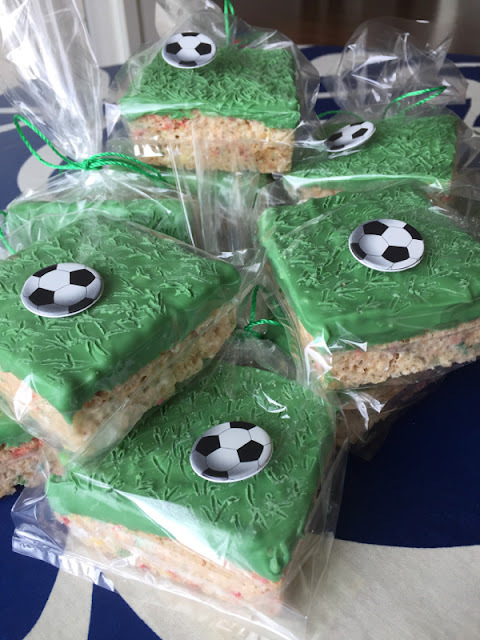 Especially, because soccer balls are hard to draw and make into food as I discovered the last time I made a soccer treat. 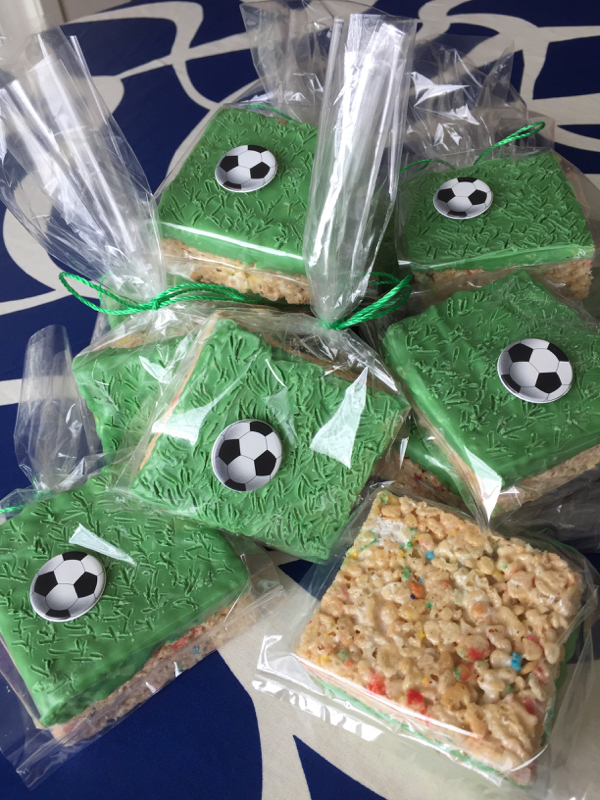 For our last soccer game, I made and gave out these soccer rice krispie treats to all the 12 players on the team. I made the coach another giant chocolate chip cookie. 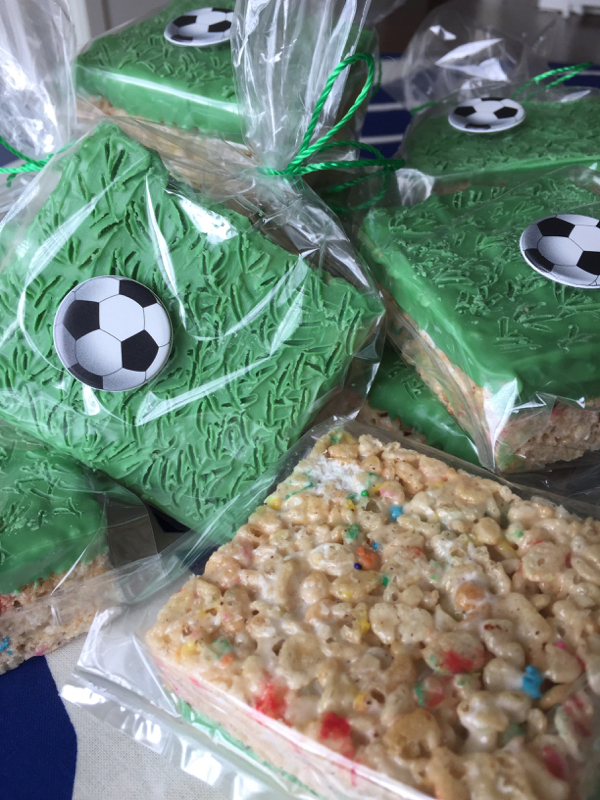 With two soccer seasons a year and the same coach and team every time, I'm starting to run out of soccer coach gift ideas! Lol. I used my favorite brown butter rice krispie recipe but with extra half-melted mini marshmallows inside and I dumped in some sprinkles too to make them like confetti. I'm still trying to use up all those extra sprinkles from the volunteer ice cream social! Then for the top, I just used green and yellow candy melts. When I finished dipping them into melted candies, I used a toothpick to draw out some grass. 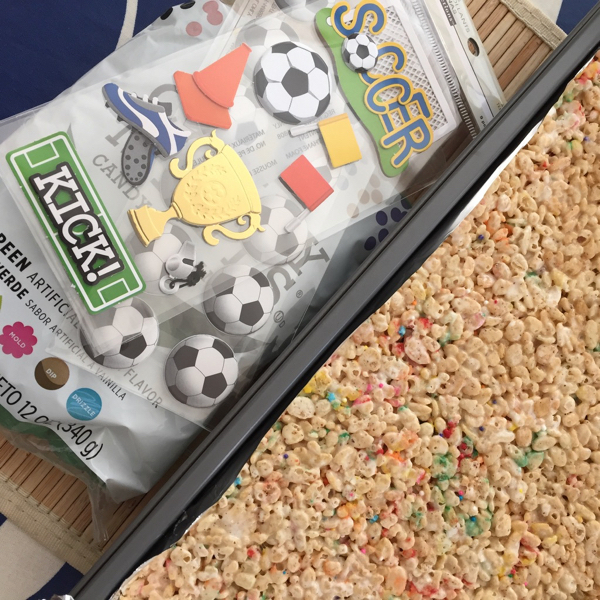 You need to do this when the candy melts are nearly dried. But don't wait until they fully dry! You'll know once you test it!